Official Responses: 0), a managed hosting and managed application services provider, has released their new ‘Managed Private Cloud' powered by VMware and NetApp. 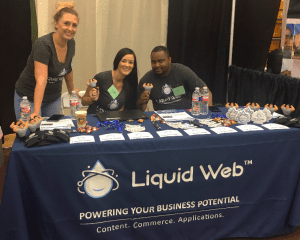 Liquid Web's Managed Private Cloud would offer "enterprise-level" features and functionality "at affordable prices" to small to midsize business. The new VMware Private Cloud delivered by Liquid Web is a VMware environment that makes it possible to provision multiple virtual machines from a single cluster of physical servers. The server nodes will support both Windows and Linux VMs, which can be used concurrently on the same hardware. Official Responses: 0), a managed hosting company with global operations, part of private equity firm Madison Dearborn Partners' brand portfolio, has announced the launch of their upgraded managed dedicated servers. Featuring the new Intel Xeon E3-1230 v6, Intel Xeon Silver 4108, and Intel Xeon Gold 6130 processors, these dedicated servers come standard with DDoS protection, "advanced" security, and built-in backup disk. Official Responses: 0), a global provider of managed hosting and managed application services to SMBs and web professionals, has appointed Taylor Rhodes to their board of directors. Mr. Rhodes brings more than 20 years of technology leadership experience to his seat on Liquid Web's board, including his previous role of President and CEO for managed cloud services company, Rackspace. Currently, Taylor Rhodes is CEO of SMS Assist, a high-growth technology startup that sells cloud-based property management software to commercial clients. Official Responses: 0), a managed hosting and managed application services provider, is now partnering with IconicWP to augment their Managed WooCommerce Hosting product line. Official Responses: 0) launched the very first Managed WooCommerce Hosting solution in January 2018 and has since launched a WooCommerce Hosting Beginner Plan that is focused on new stores, a Dropshipping Starter Plan focused on dropshippers, and a Marketplace Starter Plan focused on marketplaces. All of the Managed WooCommerce Hosting plans will now include ten IconicWP plugins that will add extra functionality to a WooCommerce store. Official Responses: 0) has launched a Beginner Plan to augment their Managed WooCommerce hosting product line – a platform dedicated to WooCommerce stores. Liquid Web claims WooCommerce to be the fastest growing eCommerce platform for store owners today. Official Responses: 0) has announced the launch of their Protection and Remediation Services, to further help safeguard customers from cyber-attacks and to address many standard compliance requirements. Liquid Web's new Protection and Remediation services will serve a dual purpose by preventing attacks on the server and application level, and by addressing many standard compliance requirements, such as web application firewall, antivirus and vulnerability scanning.